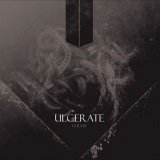 The fourth album from New Zealand's Ulcerate in six years, it's easy to see that the trio have perfected their brand of complex and layered technical death metal, something like Immolation melded with Gorguts. Both atmospheric and brutal, Vermis is lengthy with a fifty-plus minute running time (and all of the tracks apart from two interlude pieces are around the six minute mark, five are over seven minutes) and demanding. It's not hugely different from past albums that I can detect – Charles' description of The Destroyers of All as 'a darkly brooding mood piece' was spot on, and that is the perfect summation of the likes of Weight of Emptiness here, dark and slow at first, building to moments of raging speed with more than a hint of Deathspell Omega-esque dissonance. What will hold people back from really enjoying Vermis is that the tracks blend together, are often forgettable, and it's a little too long. There's little to distinguish one track from another, intro Odium and interlude Fall to Opprobrium aside, although you'll rarely be unimpressed with what the band can do. The title track, for instance, is a flurry of dissonant riffs, building up subtly into a textural wall of noise that holds you riveted in its grasp. A brief moment of calm is too fleeting to be a rest from the heaviness, the band renewing its assault almost immediately, and although there's a slight easing of the pounding later in the track, it comes across as a preparation for further attacks rather than a ceasefire, particularly in the doomy closing moments. This slightly slower pace is taken further in the following Clutching Revulsion, which takes a minute or so to explore it before speeding up into the band's usual high gear. Moments of technical wizardry in the guitars barely escape being swallowed up in the murky maelstrom of sound, and there's another calm interlude before an almost black metal section of blasting and guitar squeals. Part of the problem with the album is that the songs are simply less effective than past albums – Confronting Entropy, for example, rumbles along with an effectively chaotic structure, seeming to become angrier and angrier as it progresses, a real explosion of rage but one without direction or purpose. Technically, of course, the musicians here are supreme, particularly drummer Jamie Merat. It's hard to listen to Vermis, however, and tough to not find it a little dull. Their previous albums made more of an impact, but there's no denying that Vermis is another good addition to the band's discography, even if it feels like the band are treading water rather than pushing their brand of technical death metal onwards.